Nowadays, cycling is becoming a popular trend. For those who desire an extra boost when cycling, electric bikes may be the answer! Whether you find cycling more difficult than you did in previous years, or perhaps you wish to start commuting to work without turning up sweaty and exhausted, these battery powered bikes are sure to give you the pedaling assistance you need! Here we have discovered three of the best electric bikes currently on the market, all of which are guaranteed to greatly improve your cycling experience in the future! This Electric bike by Ancheer is manufactured in the USA, and provides you with a much easier way to cycle, taking your journey from tiring to effortless in an instant. Here we will take you through the Ancheer bike, a high quality electric Mountain bike made of 100 percent aluminum and high-strength carbon steel. Ancheer is all about quality. Their bikes are built with the customer in mind, and their bikes definitely tick all cyclist’s boxes. 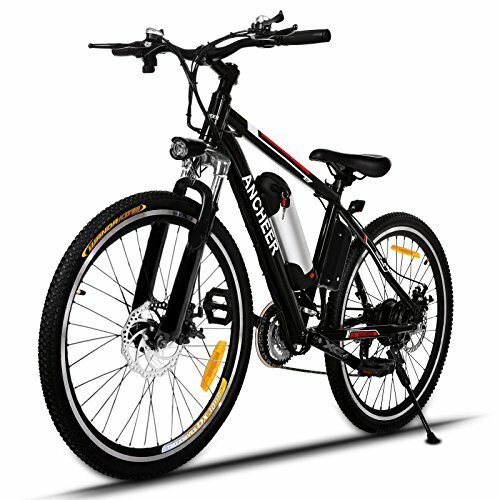 With a strong, durable design, the Electric Mountain bike is perfect for riding at a range of different speeds. Featuring its 21-speed transmission system, the cyclist can choose a range of different speeds to suit their specific journey, and with an added lithium motor they can easily ride up to 25-50km without even having to peddle! As previously mentioned, Ancheer’s bikes are made with quality, and their bikes show this. They feature strong attention to detail, from their handlebars to their adjustable seat and anti-slip resistant tires. This specific bike even features a bright LED headlamp and horn which makes it a safe bike to use even in the night. Even though the Ancheer bike is an electric bike, it can also be used as a normal assisted bicycle; therefore, the user can also choose not to use the motor if they desire. This makes it a perfect option for those looking for a more traditional bicycle design, but with the option to add extra power when required! The SwagCycle E-Bike by Swagtron is an electric bike that you may have never come across before. This E-Bike is a foldable electric bike which makes it a great little bike to store, and it can also easily fit into any car trunk when travelling. It is a perfect bike to ride, and something completely different to what you are probably used to. Here we will take you through some of the SwagCycle’s features. This electric bike is one which produces zero emissions, making it a very good product for the environment. The SwagCycle features a sleek, modern and stylish design, making it perfect for city commuters as well as those who seek adventure! Thanks to its high capacity 36v lithium-ion battery, with the SwagCycle you are guaranteed a smooth ride, without having to put in too much peddle power. The handle bars allow you to accelerate to a speed you feel comfortable with, and you have the ability to ride up to 16 km/h. With breaks, headlights and a horn, you can easily navigate through traffic without worry. The SwagCycle is an electric bike which is designed with the modern world in mind, as it is equipped with some key features which are crucial in today’s world. It is one of the first bikes to include a USB outlet, so that you can charge your devices on the go, wherever you are. With a battery indicator attached to the handlebars, you can also check the battery status to make sure you are never running low. Unlike traditional electronic bikes, the SwagCycle features a collapsing stem which allows it to be easily transported and safely stored without taking up too much space. The Electric bicycle from Nakto takes the appearance of a more traditional bicycle, yet packs some extra power! Manufactured in California, this bike is a high-quality, high-strength electric bicycle which is sure to provide you with a fun riding experience. Here we will take a look at the Nakto in slightly more detail. The Nakto electric bike is a perfect, affordable bike for riding comfortably without having to peddle too hard. Featuring a high strength carbon steel design, it is a very strong bike which is made to last a lifetime. It also features a comfort shock absorption bike seat which offers the utmost comfort during cycling. 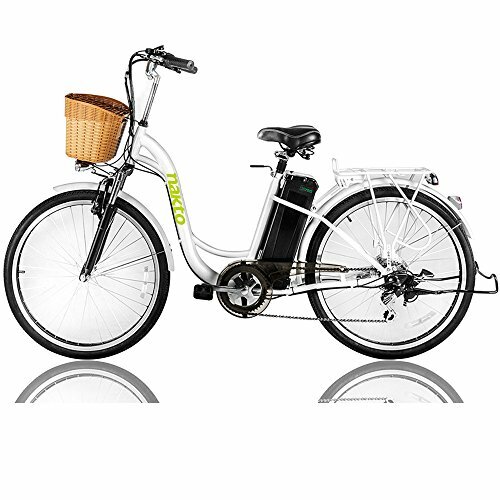 The Nakto electric bike includes a removable 36v, 10AH lithium battery, and is also equipped with a lithium battery charger. With pedal assistance the user can ride up to speeds of 30-45km, and the 250w gear motors guarantees you will be travelling safe at the 15-20 speed limit! The best thing about the Nakto bike is the option to ride with or without the motor. This means when you feel like doing a little exercise, and ride like you would on a traditional bicycle, you still can. The speed throttle allows the rider to freely choose which speed is best suited to their journey, making it a great bike for longer trips. Which is the Best Electric Bike for Me? If you really want a bike which performs well, then the Electric Mountain bike by Ancheer is definitely a good choice to make. Its strong design together with the high-speed motor definitely guarantees a good electric biking experience. 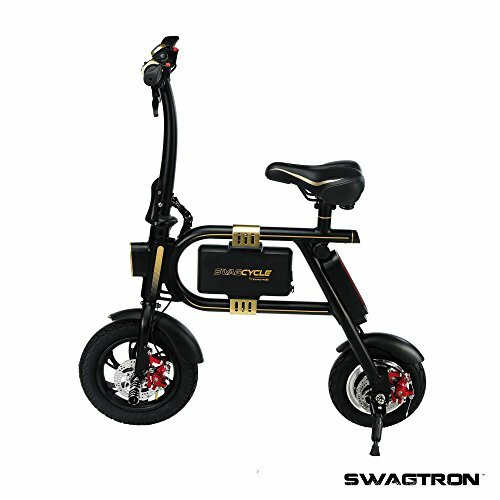 On the other hand, if you are looking for an electric bike that is easy to store and good to take around with you, then the Swagtron SwagCycle is your best bet. Its folding feature is one which makes it easy to look after, and the added bonus of having a USB outlet integrated into the bike itself makes this one a winner.